She simply can't get enough of breaking down film. That's why the 64-year-old Carberg was in front of her television at home Jan. 23 in Coconut Creek, Florida. She was watching the East-West Shrine Game and the NFLPA Collegiate Bowl. "It caught me totally by surprise," Carberg told The Associated Press in a phone interview. "I was like, 'Wow!' I just got really excited. I think it's a great opportunity for women." Bills coach Rex Ryan promoted Smith to special teams quality control coach. It is an entry-level, assistant position. But it's a path that prominent coaches such as Jon Gruden, Eric Mangini, Tony Sparano and Todd Haley took on their way to getting top jobs in the league. The 30-year-old Smith worked for Ryan with the Jets since 2009. She was the team's player personnel assistant. 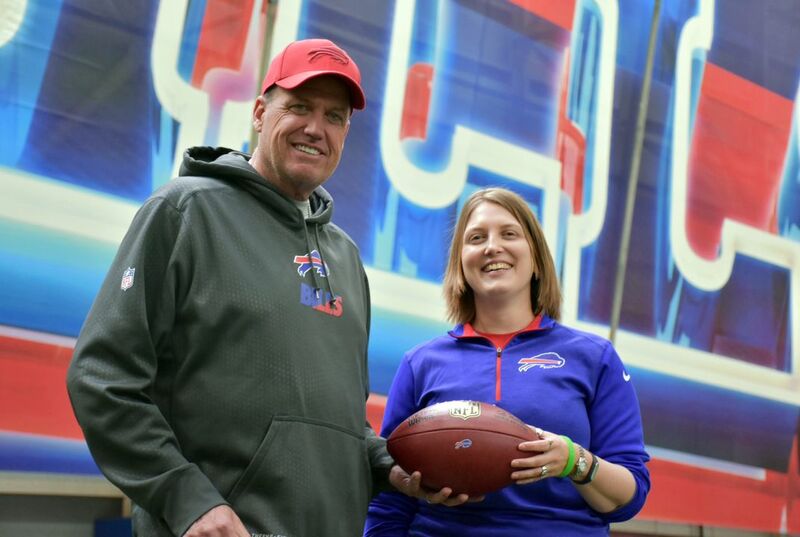 She joined the coach in Buffalo after he was fired by New York after the 2014 season. 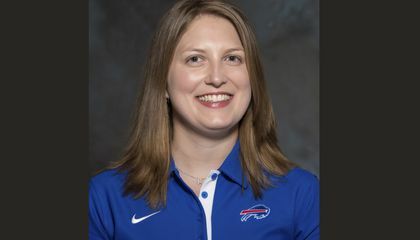 She was an administrative assistant for Buffalo's assistant coaches. She worked on various projects. As special teams quality control coach, Smith will deal with things such as charting and diagramming plays. She also will scout blocking schemes and tendencies of kickers and punters. "To me, the best part of this is that Kathryn has a chance to just learn so much and ask questions. And pick up so many things," Carberg said. Carberg served as a scout for the Jets from 1976-80. She broke a gender barrier in the NFL while watching game films, traveling and scouting college players. She is credited with bringing attention to then-little known defensive end Mark Gastineau. He became one of the league's top pass rushers. He was drafted by the Jets in 1979. Gastineau invited Carberg to be his guest when he was inducted into the team's Ring of Honor. That was in 2012. Carberg's father, Dr. Calvin Nicholas, was the Jets' internist. She was hired by New York coach Charley Winner in 1974 as a team receptionist. She became the scouting secretary before being sent on the road to watch and interview players. She left her role after the 1980 season to focus on her family. Wow, that made history in the NFL she must be so proud of what she accomplished. This article is great in my opinion. I think it is good for gender equality ,and opens the door for girls wanting to coach football. I think so too. The fact that she is the first female coach in the NFL is amazing to me. I was amazed that she was the first woman to serve as a scout for an NFL team. I was amazed about that too. I was supprised that she is the first girl to get hirred in jets then to the buffol bills from rex ryan. I think that the first female to become a coach is a moment in history to remember. It's pretty amazing that she has inspired so many women. It is a moment to remember. This is an amazing article. It just proves how girls can do anything guys can do. Also, this encourages other girls to follow their dreams and do what they would like to do. That was a pretty good article a bit boring for me though since i am not really into sports, but other than that it was cool, and its really great that women are doing these kinds of things.